Most visitors have a love-hate relationship with the traffic in Vietnam. They hate it for being messy, scary and are even perceived as dangerous. 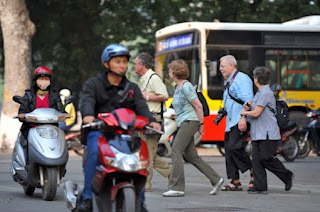 But most, if not all, will tell you that crossing the Vietnam streets is one of the best experiences during their Vietnam travel. Vietnam drivers and riders depend a lot on the body language as a guide. So the trick really is not to have any sudden movements when crossing a road in Vietnam. Here are tips for you when crossing streets in Vietnam. If it’s 2-way traffic, look right, left and then right again at the half way mark. Put your arm in the air. It makes you more visible to traffic and is an added precaution. Hopefully the arm will indicate to the motorists that you are in fact crossing the street and to look out for you. Don’t run across the road, it shows fear and you’re more likely to get mowed down. Commit yourself. Though every instinct in your body is screaming for you to stop, turn around and head back, don’t. Turning back can be more dangerous than continuing on. There’s always safety in numbers. The same applies when in Vietnam. 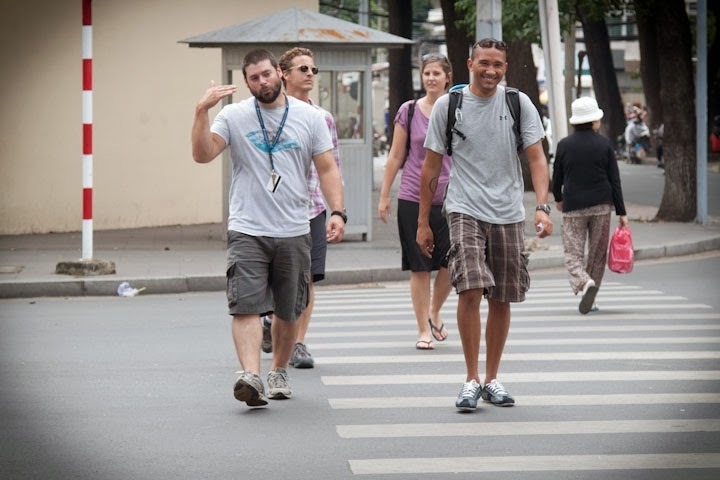 You’re much more likely to be seen by a motorist when walking with a group than venturing across the street solo. Traveling alone? Don’t feel bad being that creeper who silently stalks along next to a family crossing the street. Better safe than dead.